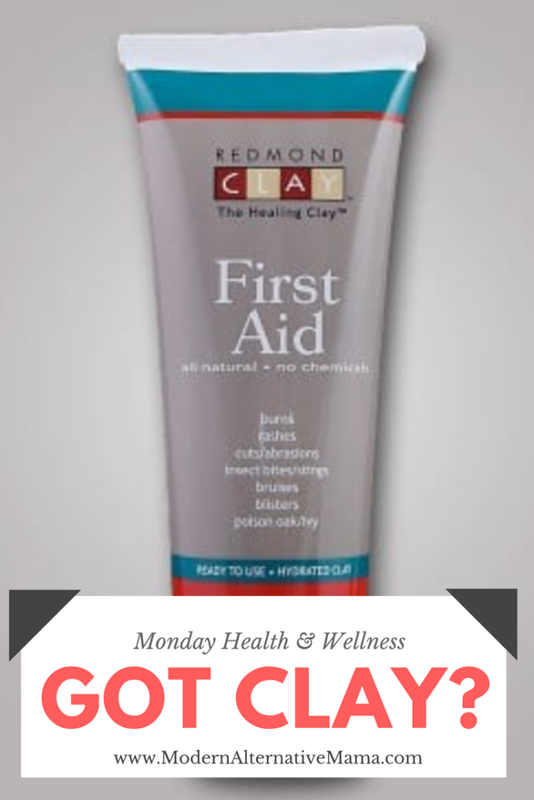 Monday Health & Wellness: Got Clay? I don’t know about you, but we’re constantly trying to build up a decent medicine kit around here. A natural one. I don’t use any form of OTC or “mainstream” medicine at all (especially not for acute illnesses) and I’m even a bit wary of homeopathy after our recent experience with teething tablets (you’ll hear about that next week). With so many different options out there, and many of them expensive, it’s hard to know what to include in your medicine cabinet and what not to. It’s important to have all the basics covered, but you don’t want to have 50 different products on hand, either. How are you supposed to remember what to use and when? I’m becoming more choosy about what I really keep around. I keep things that I really, actually use, that have been proven to help my family in a variety of situations. Now — what works best *for us* may not be what works best *for you* and you should keep that in mind. Everybody’s constitution and specific ailments/symptoms and best remedies is going to differ a bit. This is a jumping off point for you to do some more research to see if what works for us does work for you! 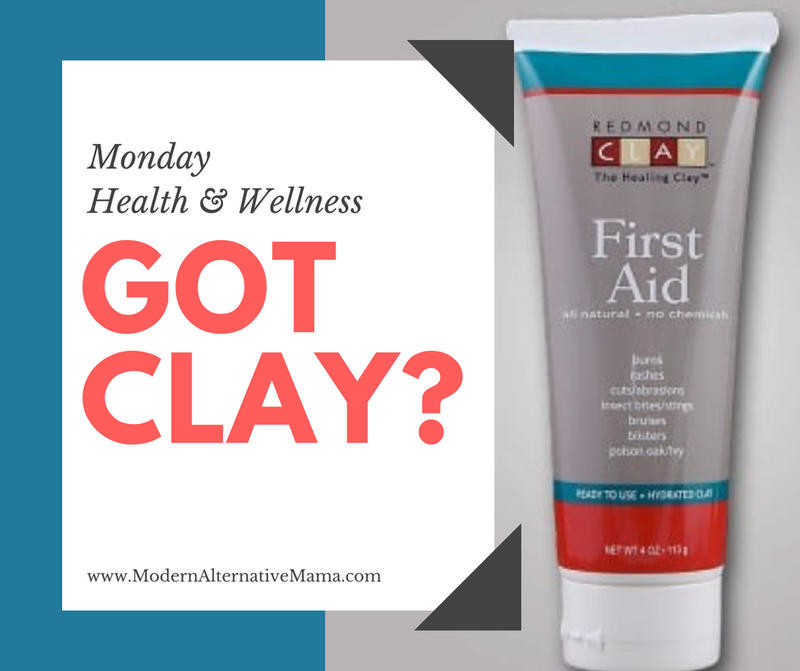 In this case, I’m talking about Bentonite clay, a specific type of clay that can be used for many different ailments. We’ve personally used it in many ways and I really do like having it on hand. It comes in many preparations, from plain ol’ dry powder to various creams, pills, and more. Redmond Clay specifically (same parent company that makes Real Salt) makes all of these wonderful clay products. Bentonite clay is a product that carries an electrical charge. It is negatively charged, and most of the toxins and junk in your body are positively charged. Therefore, when the clay is taken (it can be used safely internally or externally), it binds with the toxins and carries them safely out of your body. We have personally used it as a supplement to combat the general “junk” in the system, and did find that it seemed to help. It’s handy to have around and to be taken at the first sign of illness, to hopefully head off nausea and vomiting. It can be taken in capsule form, or dissolved in quite a bit of water and simply drunk. It depends on how you prefer to take it. Regardless, it is important to drink quite a bit of water, as the clay absorbs a lot, and this will help the “junk” move through your system and out. Clay is safe to use, non-toxic and I haven’t yet heard of anyone being allergic to it. For those concerned about achieving an alkaline pH balance, clay can assist with this when taken as a daily supplement. Using clay as a facial mask can help draw the gunk out of your pores, clearing up your skin (this is probably the best-known use for clay). Another popular use is in a bath, to pull the toxins out through your skin. We have done this, and it helps, but it is very messy! Our favorite use was for a wasp sting. My 3-year-old was stung and came in the house complaining his arm was red. I could use the small hole indicating a sting and I knew there were wasps in the backyard. I administered a homeopathic remedy (apis) and put clay over the sting. Within an hour, there was no more mark and he said it didn’t hurt anymore. My husband also used the clay on some small yeast-related bumps on his arms and some poison ivy. The clay helped to draw these out and heal. So as you see, there are a lot of excellent uses for clay. It’s very safe to use, and can be used on even younger babies safely (externally). It has a multitude of uses, meaning that just one product can help with many common ailments — freeing up both space in your medicine cabinet and money! Redmond Clay makes all of these preparations, as well as a clay-based toothpaste called Earthpaste! We also loved the Earthpaste, because it’s a truly safe and beneficial toothpaste. I don’t have to worry about my young children swallowing it. It looks funny (it’s, well, clay-colored), but it tastes good and works well. It’s so hard to find a truly safe option out there and this is the first one I actually feel good about recommending. It’s fluoride-free, of course. Today, THREE lucky winners are going to get to try out clay for their families for free! That’s a $50 value. Pretty awesome! “Like” the brand-new Modern Alternative Pregnancy on Facebook! Only the first entry is required; all others are optional (but they increase your chances to win!). This giveaway will be open through Friday, 8/17/12. It is open to U.S. residents over 18 years of age. Three winners will be chosen via WP plugin “And the Winner Is….” and will be announced on Monday, 8/20. All entries must be left in SEPARATE comments to count. Congratulations! You should hear by email about claiming your prize. Why do you most want to try clay? Or if you have before, what’s your favorite use?